This week, Anna Barton celebrates her 80th birthday! For more than forty of those years, Anna has lived in the Findhorn Community on the shores of the Moray Firth in the north of Scotland. Friends and other community members will gather to celebrate Anna's life and the joy she has brought them. I first came to know Anna as a writer and storyteller. For the past several years, she has been a regular storyteller at Findhorn's monthly "Wee Ceilidh" where she'd share stories of her children and of being a parent. Fortunately, Anna kept notes when her children were young and turned them into joyful stories full of the quirky and delightful things children say and do. Anna can also turn her humour on herself, relating some of her adventures and misadventures in the world of sacred dance. 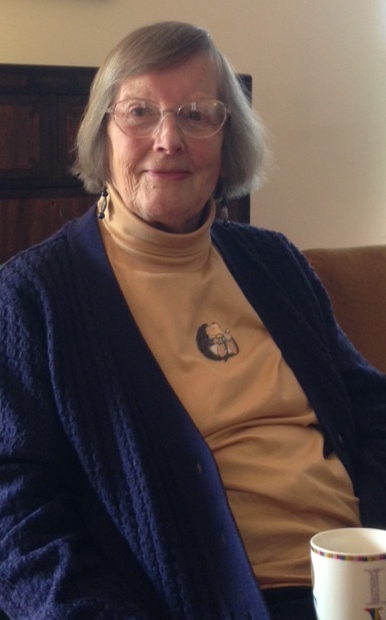 In 2015, I finally caught up with Anna in her home in Findhorn and managed to spend an afternoon reminiscing and sharing stories from her life as a parent, an early member of the Findhorn Community, as a sacred dance teacher, and now elder in the community. In honour of her 80th birthday, the Teller and the Tale repeats this interview and wishes Anna a very Happy Birthday!! Listen on Blues and Roots Radio, starting this Sunday 12 June at 7am ET (Canada/US), 12noon (UK/Ireland), and 9pm (Australia). Repeated on Thursday 16 June at 4pm ET, 9pm (UK) and 6am on Friday 17 in Australia. If you miss it, go to the Teller and the Tale website where it will be posted after the end of the week.